1. What will be the cost of repairing/replacing my automotive glass? Repairing a rock chip in your windshield is often much more affordable than replacing the windshield. Costs may vary according to the location of the damage, its size and your insurance coverage. Request a quote today and let one of our experts provide you with all the information you need. 3. Can Broco Glass® take care of my insurance claim? We take care of your insurance claim from beginning to end. We can validate all your coverage details with your insurance company and even process all your paperwork. We are an approved vendor for the Insurance Corporation of British Columbia (ICBC) through the Glass Express certification, Royal Sun Alliance and most Vehicle Fleet Management Companies in B.C. 4. What kind of glass do you use? We are committed to offering our customers the best quality products and services. That’s why we use Original Equipment Manufacturer (OEM) glass made by the same manufacturer as your original glass, or certified equivalent glass made to the same standards, but by a different manufacturer. 5. What is covered by your warranty? A replacement windshield is warranted against manufacturing defects and leaks (with the exception of leaks due to vehicle body deterioration) for as long as your own your vehicle. This warranty expires when your vehicle is sold or given away. Windshield repairs are guaranteed as long as you own your vehicle. If the repair cracks again in the same spot, we will credit the amount of the repair against the windshield replacement cost. 6. 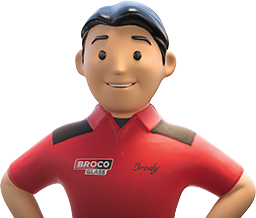 Where is my most convenient Broco Glass® service centre located? To find your nearest location, please refer to our service centre locator.